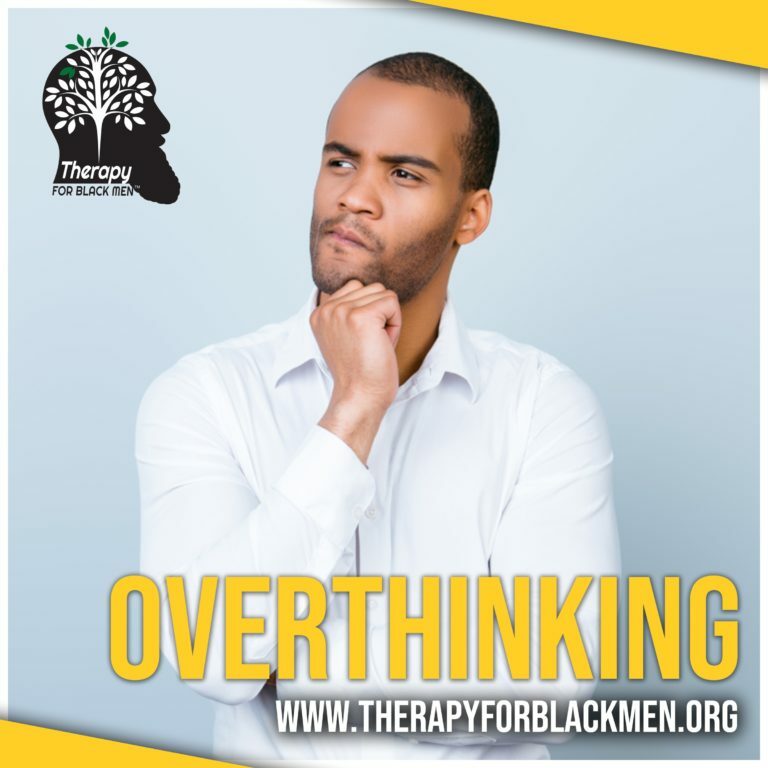 There are some who like to “think things over,” and then there are others who “overthink.” If you fall into the overthinking camp, unfortunately, you do yourself a disservice. Overthinking does not serve anyone well as it causes one to think about something too much and for too long, leaving you exhausted and in a negative mindset. In a society where multiple narratives play depending on one’s gender, race, culture or sexual orientation; if you fall into one or multiple marginalized groups, it isn’t difficult to second guess experiences and “get stuck in your head.” Because of racism, coupled with society’s confusing definition of masculinity, as a black man interacting in this world, it’s easy to replay situations and interactions wondering if you’re over or under-reacting. Be careful not to internalize an external narrative. Having a healthy view of self is crucial in combating the false narrative of being less than that is played overtly or via microaggressions. Being an anxious person, you will naturally worry and be fearful. Those who struggle with anxiety already have the habit of being in their heads. You may find yourself over-processing before, during and after most interactions. Often times, if you have a history of not being affirmed, or your voice being heard and validated, you can struggle with having a low view of self. This could be the cause of stressful overthinking. How can you be confident in your decisions or interactions if you are constantly walking under a shadow of self-doubt? Similar to low self-esteem, if your narrative includes a childhood where individuals and circumstances were unstable, this can create unnecessary confusion to a child. Overthinking then becomes a pattern of processing to combat the uncertainty. Being analytical can be a great strength. However, be careful that you keep your analytical mind in check. You want to make sure that it doesn’t turn on you and shift from critical thinking into harsh self-criticism. Self-awareness is simply being able to take an honest look at yourself without judgement. It affords you the ability to understand how other people could perceive you and your reaction to them. It is easy to question others’ thoughts and motives, yet not practice the exercise of challenging your own thoughts. Learning to check your thoughts helps you minimize automatic thinking that may not be based in fact, but more so in familiar emotions and thoughts. You may find that you tend to lean more negative in your thinking. Learn to recognize and replace or reframe your thinking. If you are unsure if you’re veering towards overthinking a situation, ask someone you can trust to offer an objective perspective. Having someone be a soundboard can help provide constructive feedback and highlight possible blind spots. Dwelling on your problems isn’t helpful, but looking for solutions is. Ask yourself what steps you can take to learn from a mistake or avoid a future problem. Instead of asking why something happened, ask yourself what you can do about it. Sometimes you just need to turn your attention elsewhere and give yourself a break. Try doing an activity, blow off some steam by exercising or shift the conversation in a different direction. Whatever it is, do something to get your mind off the path of going down the rabbit hole. A little distraction isn’t harmful as long as you are not using this method to always avoid dealing with and resolving issues. There’s always a space and time to reflect. However, if you find yourself becoming overwhelmed and stressed, try these tips and remember that you do not have control over life, but you do have a great deal of control with how you view and interact with it. You do not need to fall victim to overthinking, but can view circumstances as opportunities to increase your self-efficacy and emotional intelligence. You don’t have to be a victim to your mind if you succeed in training it to positively serve you to live well. Farah Harris is a licensed therapist in private practice and workplace wellness advocate. She is the founder of the Facebook group, WorkingWell Daily, a community that addresses self-care and work-life alignment. Her personal mission is to help individuals find and own their voice. Harris works to connect people to their stories to produce truth, freedom and self-actualization. Pragmatic in her approach with peppered humor, Harris aims to help clients identify professional and personal strengths and weaknesses that can be harnessed into meaningful growth that supports their goals. Farah resides in the south suburbs of Chicago with her husband and three young children.